Girls in northern Nigeria prepare a meal. The crisis caused by the Boko Haram insurgency threatens to undermine development throughout the region. 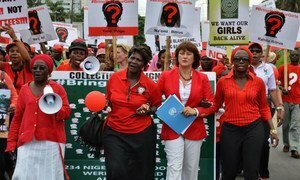 United Nations human rights experts have welcomed the release of 21 Chibok school girls from Boko Haram and called upon Nigerians – particularly their families and local communities – to support their immediate reintegration and rehabilitation. UN Special Rapporteurs on, respectively, the sale of children, Maud de Boer-Buquicchio, slavery, Urmila Bhoola, and the right to health, Dainius Puras, lauded the Nigerian authorities for the success of their negotiations while simultaneously calling upon institutions and communities to ensure that the girls would experience a full recovery and be protected from “stigma, ostracisation, and rejection” in a joint news release from the Office of the UN High Commissioner for Human Rights (OHCHR). They underscored that a full recovery could be challenging and that in order for the girls, to be adequately rehabilitated, they would need solidarity from the Nigerian people. The experts added that such support is not only a moral obligation, but a fulfilment of women and children’s legal rights under international law. The girls were released last week after Boko Haram abducted them in the middle of the night in April of 2014 from their school dormitory in Chibok. The release was welcomed by UN Secretary-general Ban Ki-moon, who encouraged the international community to support their rehabilitation. The Special Rapporteurs also referred to a report that was issued after a joint visit to Nigeria in January of this year and maintained their ongoing assistance and willingness to provide further advice and support in order to ensure that all of the missing girls can return home. Special Rapporteurs and Independent Experts are appointed by the UN Human Rights Council to examine and report back on a country situation or a specific human rights theme. The positions are honorary and the experts are not UN staff, nor are they paid for their work.